Collie is a town in the South West region of Western Australia, 213 kilometres (132 mi) south of the state capital, Perth, and 59 kilometres (37 mi) inland from the regional city and port of Bunbury. It is near the junction of the Collie and Harris Rivers, in the middle of dense jarrah forest and the only coalfields in Western Australia. At the 2016 census, Collie had a population of 7,192. Collie is mainly known as a coal-producing centre, but also offers industrial, agricultural and aquaculture tourism industries. Muja Power station is located east of the town, and to its west is the Wellington Dam, a popular location for fishing, swimming and boating. The town is named after the river on which it is situated. James Stirling named the Collie River, which in turn is named after Dr Alexander Collie. He and were the first Europeans to explore the area in 1829. Coal was discovered in the area by a shepherd named George Marsh in the early 1880s. The coal fields were developed in the late 1890s and the townsite surveyed and gazetted in 1897. 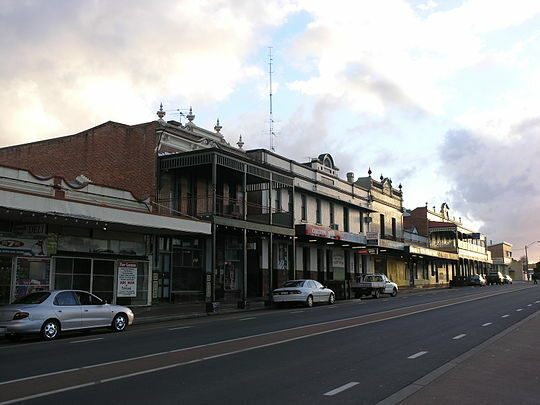 Collie was once referred to as a "dirty mining town", but on 8 April 2006 it won the Australian Tidy Towns Competition from finalists from six States and the Northern Territory. Collie was named the top Tidy Town because of the commitment of the community to recycling, waste management, beautification and community projects. According to the 2016 census, there were 7,192 people in Collie. Aboriginal and Torres Strait Islander people made up 4.7% of the population. 78.1% of people were born in Australia. The next most common countries of birth were England 3.5% and New Zealand 2.5%. 87.8% of people spoke only English at home. The most common responses for religion were No Religion 35.6%, Catholic 20.6% and Anglican 19.0%. Collie has a significant role in the provision of electricity for Western Australia. There are two coal mines in the town and three power stations. The government of Western Australia will soon commission a new base load power station, for which a number of Collie base proposals have been made. Initially Western Collieries, the Premier Coal Limited mining operation (Yancoal Australia) produces approximately 5 million tonnes of coal per year. It contains enough reserves for another 30 years of mining at the present rate. The Griffin Coal mine is owned by the Indian company Lanco Infratech. Collie has five primary schools, Allanson Primary School, Fairview Primary School, Amaroo Primary School, Saint Brigid's Catholic College and Wilson Park Primary School and one high school, Collie Senior High School. Tourist attractions at Collie include the Steam Locomotive Museum, Collie Art Gallery, Minninup Pool and Wellington Dam. Parks include Soldier's Memorial Park and natural features include Stockton Lake and Collie River. Collie also hosts the Collie Motorplex, one of Western Australia's few permanent motorsport venues outside the Perth metropolitan area. Collie experiences a Mediterranean climate with hot, dry summers and cool, wet winters (Köppen climate classification Csb). The town was lashed with unseasonal storms on 12 December 2012 resulting in some flooding in the town. The town received 126 millimetres (5 in) of rain in a 12-hour period; several houses were evacuated. ^ a b c Australian Bureau of Statistics (27 June 2017). "Collie (Urban Centre/Locality)". 2016 Census QuickStats. Retrieved 3 November 2018. Material was copied from this source, which is available under a Creative Commons Attribution 4.0 International License. ^ a b Australian Bureau of Meteorology (April 2019). "Climate statistics for Collie". Australian Government. Archived from the original on 13 February 2012. ^ Western Australian Land Information Authority. "History of country town names – C". Retrieved 2011-05-30. ^ Western Australian Land Information Authority. "History of country town names – C". Retrieved 2010-09-26. ^ 2006 Tidy Town Media Release Archived 19 August 2006 at the Wayback Machine www.collie.wa.gov.au. Retrieved 13 August 2006. ^ a b "Why Premier Coal". Premier Coal. Retrieved 10 September 2014. ^ "Our History". Griffin Coal. Archived from the original on 29 December 2014. Retrieved 21 December 2011. ^ Martin, Lucy; Taylor, Roxanne (13 December 2012). "Houses flooded as storm lashes Collie". ABC News. Australian Broadcasting Corporation. Archived from the original on 31 October 2016. Retrieved 13 December 2012.